Every week, we shine a light on either a region or producer that we feel is making exceptional wine and make them our Featured Wines of the Week. This week, we're putting the spotlight on two exceptional wine producing countries, Georgia and Lebanon, with a look at a great producer from each. What is Qvevri? What is a Chateau doing in Lebanon? Do as the Romans the do? Read on below. This sale runs from 3/25/18 to 4/1/18. We tend to think of France and Italy when we think of the foundation of old-world wine, and there's plenty of reasons for that. from well-established wine regions to the quality of the wine produced, the French might even insist that they started it all. But thanks to archaeological digs and historical records, we've found the oldest signs of wine to exist in lands that make up the Caucasus region, dating between 8000 and 4100 BC. You might wonder where that exactly is. 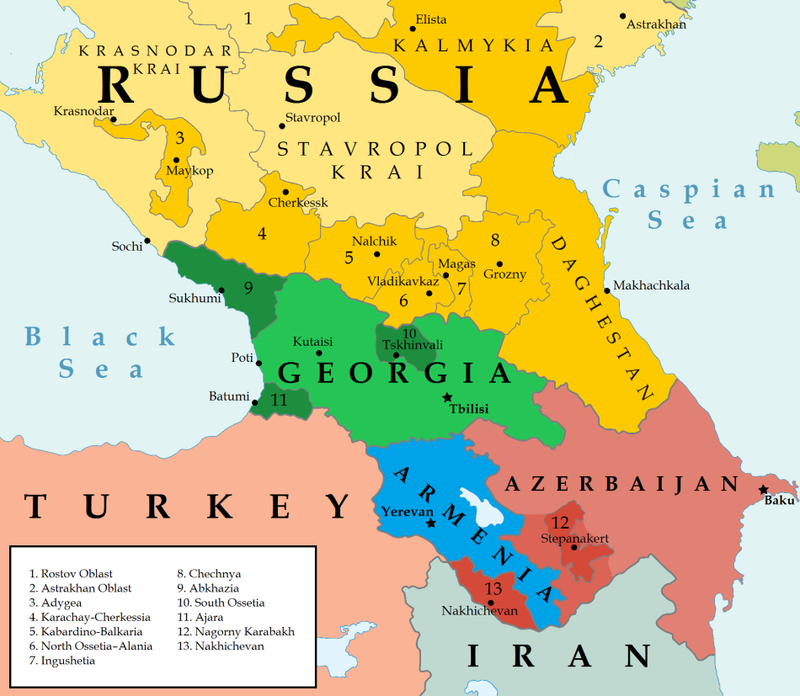 You may have heard of the region as the area in between the Caspian and Black Sea, but for the non geography majors out there, that's not exactly easy to picture. — The Beatles "Back In The U.S.S.R."
After having so many years of experience under their belt, it's no surprise that Georgia actually makes good wine, and they've got a neat little trick up their sleeve to help them do it. We find ourselves in Kisiskhevi, close to Georgia's eastern border, at the Schuchmann Winery. The Schuchmann winery was started by a German expat, Burkhard Schuchmann in 2008 after a visit to the country and a discovery of the great wines within. Doqi, his latest venture, is a call back to Georgian hospitality, the name a reference to the almost ubiquitous clay vessel where the house wine is kept. But it's a different ancient tradition that makes these wines special, and that's the use of the Qvervi. 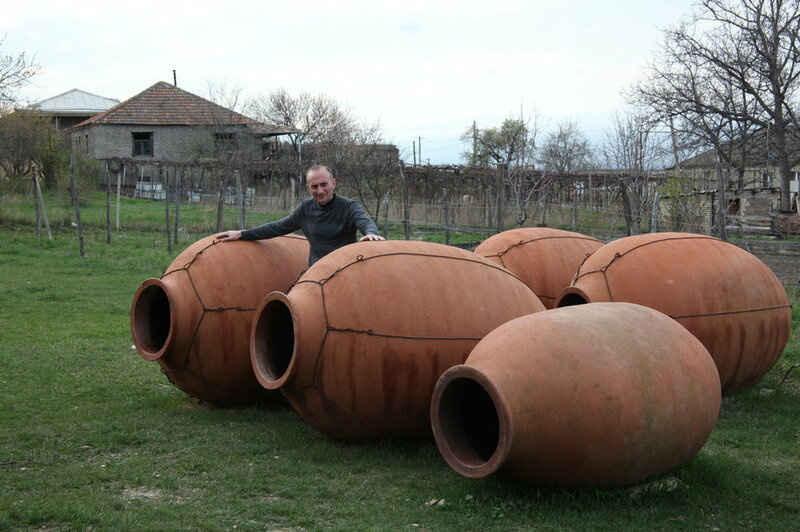 Qvervi are large clay vessels that have been part of Georgia's traditional wine-fermenting process going back almost 8,000 years. These are buried half underground as a means to stabilize the wine as the fermenting process continues through the winter, at a time where electricity was out of the realm of possibility. One of Georgia's most prized white grapes, Rkatsiteli (meaning "red stem"), is given this treatment, producing a wine with an amber, lightly brewed tea-tea like color, and transforms this rich white varietal with notes of warming spices and honey along with the texture that goes along with prolonged skin contact fermentation. We couldn't just feature Georgia's most important white grape without featuring its most prominent red, Saperavi (meaning "color/dye"). While the Doqi winery makes a traditional Qvervi fermented version of this wine, it also produces one in a more "Western style" wine, through a combination of aging in both neutral French barrique and stainless steel vats for 12 months before bottling. Sourced from vineyards in the foothills of the Caucasus Mountains near the town of Napareuli, this wine pours dark red, to the point where some Georgian winemakers will call it "black wine." Saperavi is considered a teinturier grape, a wine term for when a red wine grape has both dark skin and flesh. Despite the inky black hue, this full bodied red has plenty of acidity to go with its alluring combination of licorice, chocolate, earth, and black fruits. Both of these wines are sourced from vineyards that use sustainable practices and showcase what Georgia's Kakheti wine region has to offer. Our trip isn't quite over though, we're also showing wines from a country that seems like a whole world away. There's another story when it comes to the origin of wine, and Bekaa Valley in Lebanon is at the heart of it. There are records of the Phoenicians exporting wine from this region some 4,000 years ago, and when the Romans came, well, we know the Romans loved a good jug of wine or two. But fast forward a couple thousand years and through countless international and ethnic conflicts, modern day Lebanon was controlled by the French from 1918 until declaring its independence in 1943. In the midst of that tumultuous time, Gaston Hochar founded Chateau Musar in 1930, and tended the grapes until his son, Serge Hochar graduated from the University of Bordeaux in 1959. Since then, it's been continually run by the family, with Serge and his brother Ronald Hochar maintaining the control until Serge suddenly passed away in 2014 due to a swimming accident in Mexico. Strange things indeed, but the wine is universally beloved, and often compared to Bordeaux, or the wines of the Rhone, depending on the vintage. This is, of course, due to the French family in Lebanon, and the fact that they use the classic French varietals: Cinsault, Carignan, Cabernet Sauvignon, Syrah & Grenache for the reds and Obaideh (a native varient of Chardonnay) and Merwah (a native variant of Semillion), Chardonnay, Viognier & Vermentino for the whites. While they are alike quality-wise, the nature of comparing these two regions is unfair to the unique character of the Chateau Musar grapes. The Bekaa Valley sits some 3,300 feet above sea level, and is located just 30 kilometers east of the capital Beirut, and Chateau Musar holds some 150 hectares (371 acres) total that account for some 58,000 cases of wine produced in a year. We're thrilled to have two wines from the newest Musar line, Musar Jeune, sourced from the younger vines at Chateau Musar's long-standing vineyards. The Musar Jeune Blanc is made up of 40% Viognier, 30% Vermentino, and 30% Chardonnay sourced from organic vineyards with two distinct terroirs. The Viogner is grown on fine silty soil, while the Chardonnay and Vermentino have more limestone rich soils. The blend is full of exotic fruits on the nose with a beautifully floral and crisp finish. The Musar Jeune Red, however, is made up of vines ranging from 15-60 years with 50% Cinsault, 30% Syrah, and 20% Cabernet Sauvignon. Following the Musar tradition of non-intervention, the wine is completely unoaked, and fermented in concrete vats, without fining or filtration. The result is a wine that pours a rich burgundy red, with notes of violet and fresh summer cherries on the nose while ripe summer fruits and light notes of hibiscus fill the palate among soft tannins and fresh acidity. These are beautiful wines from two classic underrepresented locales with longstanding wine traditions that are outside of the classic European mold.